Disclaimer: As a member of the RockNBlog team, I received free race entries for both races. As always, all opinions are my own. After months of anticipation, the weekend I’ve been waiting for finally arrived – Rock ‘n’ Roll Chicago! I’ve done this race twice, and each time was different. In 2015 we battled sweltering heat and humidity, it 2016 it was humid but overcast and rainy, and this year it was rain, rain and even more rain. You never know what the weather will be like in July in Chicago, but it was still a fun weekend. Oh, and did I mention that I got to meet a ton of bloggers as well?! Read on to learn about my 3 full days of fun! Luckily our flight was on time (despite storms in Chicago). We were able to check into our hotel room early and then headed to Corner Bakery for a quick breakfast. After breakfast, we hopped on the bus to go to McCormick Place to hit up the Expo. After grabbing my bib and heading over to the Solutions table to drop down from the half marathon to the 10K, I walked through the expo. There weren’t a ton of vendors but the ones that were there were good. Of course I had to stop by the Pro Compression table to pick up some socks! Now I usually don’t buy a ton of stuff at expos (unless I’m running the marathon), but there was a huge selection of Brooks merchandise and they had 35% off certain items so I had to make a few purchases! All the goodies I purchased from the Expo! I was also able to spend some time with Deborah and Michelle at the Expo. I haven’t seen Michelle in about 2 years and it was my first time meeting Deborah in person. It was lovely and we had a fun time taking photos! After the Expo, I headed back to the hotel to shower and get ready for dinner. We had a lovely dinner at Barrio and I finally got to meet the other Kim! After dinner it was time to head back to the hotel and get some sleep to conquer the 5K the following morning. It was time for the 5K! Before the race, many of the bloggers planned on meeting up for a photo. I got to meet even more bloggers and we chatted like we had been friends forever! After the photo we tried to get into our corral but they were totally full. Tons of people were waiting on the outside of their corrals to get in (this would also happen on Sunday). Luckily we were able to sneak in once the first 2 corrals started but it was still super crowded. The 5K race starts and ends in Grant Park. For the first mile you run by Millennium Park and Maggie Daley Park. Then you run by the Harbor. This is where the race got a little more crowded and the path narrowed. It was hard to find a rhythm during this point but luckily it didn’t last too long. Shortly after Mile 2, we headed back toward Grant Park along South Lake Shore Drive. Before I knew it, I heard music so I knew I was close to the finish line. A few minutes after crossing the finish line, Mother Nature decided that it was a good time to start a downpour. I can’t complain since it happened after the race finish! My mom and I stopped for a photo on the walk back to the hotel once the rain stopped. Once we got back to the hotel, I took a quick shower and got ready to meet everyone for brunch. Not only did I get the most delicious red mimosa (strawberry), but the Belgium waffle I ordered was also absolutely delicious! It was also great to finally meet Susie, Linda, Holly, Wendy and Lindsey in person at the blogger brunch as well! We all chatted like we had been friends for years even though this was the first time many of us were meeting in person! The rest of the day was pretty lowkey, but I did enjoy some delicious pizza from Giordano’s for dinner. Before long it was time to go to sleep to get ready for a super early wake up as the 10K and Half Marathon both started at 6:30 a.m.!! Wow, that 5am alarm came up quickly! I didn’t get a lot of sleep so I was basically half asleep during my walk to the race start. The plan was to meet up with everyone one last time before starting the race but things were super hectic and crowded so I only ran into Linda, Deborah, Michelle and Kim before the race. As we were waiting in the corral to start the race, Mother Nature thought it would be cute to give us a little bit of rain. It wasn’t anything crazy, just a light rain. Then about 3 minutes into the race it started to downpour – I was completely soaked before mile 1. Okay…so it’s going to be one of those races, no problem! I’ve run in the rain before so this was nothing new to me. I would also much prefer that it be cloudy, humid and raining instead of sweltering hot and humid. The 10K also starts and ends in Grant Park. You run along the Harbor and through a park. It was a really peaceful/serene run. A little before mile 5 we merged with the half marathon course and ran under McCormick Place. I’ve never liked this area of the course because it’s very dark and I’m always worried that I’ll trip and fall but luckily I made it through in one piece, lol. The last mile of the race was really fun for me. It was awesome seeing all of the super speedy half marathon runners finish strong for a good finish. It was also nice to see more crowds at this point since the rain had stopped. I could see the finish line in the distance and a few minutes later I finally crossed the finish line! My Rock n Roll Chicago weekend was complete and I had earned both medals and the remix medal. Similar to the 5K, soon after crossing the finish line, the skies opened and it started pouring, A LOT! The theme for the weekend was rain so this was not surprising, LOL. All in all it was a good weekend despite the weather. As always, here are my race pros and cons! Awesome Race Medals – RnR never disappoints when it comes to the race medals! Volunteers – I have to give a shout-out to the volunteers. Everyone I encountered was super nice AND they did all of that in the pouring rain! VIP – I was gifted the VIP experience for this race and it was great. Lots of food to eat, mimosas, massages and private bathrooms! i also should have taken advantage of their gear check but forgot. Remix Medals – I heard from several runners that they ran out of Remix Medals. This was very disappointing, especially for runners that did the half marathon. Luckily the medals will be mailed to these runners in about 4 weeks. Race Shirts – While I thought the designs were kinda cute, the shirts ran super small this year. Bib Pick-Up – Friends/Family were not allowed to pick up bibs for other runners. I have been able to pick up bibs for friends in the past in both Brooklyn and Philly so I’m not sure why this changed. This is such an inconvenience for people who had flight delays due to the weather, work long hours, etc. Bib Switch – I was originally signed up for the Half Marathon but dropped down to the 10K, yet I kept the same bib (they just changed the tracking for the bib). I would have preferred to get a 10K bib. I was worried that they would try to give me the half marathon medal at the finish (similar to what happened in Brooklyn), but luckily they gave me the 10K medal. Age Group Awards – Not specific to RnR Chicago, but it would be good if RnR gave out AG awards for distances shorter than the half marathon/marathon. 10K Course – The half marathon course goes through the city. It would be good if the 10K course could have run in the city, at least for a mile or so. That’s it! Thank you Chicago for such a nice weekend and I think I’ll be back next year! Have you done an RnR race? Have you ever ran a race in Chicago? Sounds like everyone had a great time meeting up! Chicago is on my “someday” list. I hope you get to run RnR Chicago one day. I loved seeing you and getting together with everyone! Your mom is a running icon! 😀 I agree with you on all of your points. I always seem to struggle with logistics for this race. Didn’t even realize there were no AG awards for the shorter races. My mom and I enjoyed meeting everyone as well. I think she is finally starting to believe me when I say my blogging friends love her! The logistics for the race seem really hard for people that have to come into the city by train. It was such a fun weekend! Having never run in the rain, I’m surprised I didn’t mind it at all. I think it would be a whole different story if it was also cold. I mostly found it humorous–as it just wouldn’t let up! It was so fun meeting you and everyone else. We definitely have to plan to do this again! Sometimes running in the rain can be really refreshing, especially when its hot or humid. You handled the rain like a rockstar! Congrats on the races, and what a fun weekend! I agree, rain is so much better than heat/humidity. Thanks! I saw that shirt and just had to have it! Me too! It’s like I have a permanent smile on my face that will not leave. There were so many of you guys there. So fun! I’ve never done an RNR, maybe someday. I don’t normally buy race expo stuff either, but I love a new running tank! it was a super fun weekend. Originally we didn’t plan it, but it just so happened that a lot of bloggers ended up doing that race! Love that Rock ‘n Blog shirt, so cool! It’s weird that they had those rules for the bib pickup…super inconvenient. And congrats to your mom on those AG victories! Yes, I’m hoping that they can change those rules for bib pickup because it’s just so not convenient for many people! FINALLY, the #2Kims got to meet!!!! Seriously, it was such a great time getting to know you better, and your mom is such a sweet lady 😉 This weekend was pretty EPIC (I have over-used that word, but nothing else comes close)! I hope to see you (and Mom) again…maybe in Philly? nope, you can never over use the word epic when it comes to this weekend! It was honestly just so much fun! Congratulations! I’ve had some serious FOMO watching all my favorite bloggers get together last weekend. I’m glad you all had such a great time! Thanks so much Debbie! The weekend went beyond my expectations! She has an insta account but she doesn’t use it that much. I’m gonna try to convince her to be more active on it. This weekend absolutely sounds like a blast! I’m glad you were able to meet up with everyone and have such a good time! This race sounds like a great one and is definitely on my radar for the future! It was a really, really fun running weekend. I always enjoy racecations but this one was extra special! There was so much good about the weekend that it really outweighed the bad. The rain? Kept us cool. I’m just so glad we were able to finally meet! What an amazingly fun time. What will we do to top this one? I have no clue what we can do to top this weekend…maybe a tropical destination for a race, like Hawaii?! You and your mom are super cute! So fun that y’all run/race together! I love all the blogger pics! So jealous I wasn’t able to be there! I have run a few RnR races before, and overall they seem really put together! 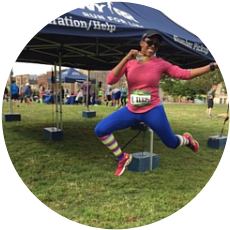 I hope that you can join the next blogger meet up at a race!